Hubbard's Farm Princeton Mass. 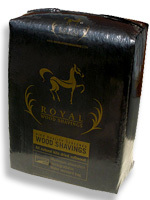 Royal Wood Shavings Equine Bedding Pellets. This all natural softwood, dust free product is manufactured specifically for animal bedding. These medium blend shavings are 100% biodegradable, and kiln dried to kill harmful bacteria, reducing respiratory diseases and allergies. We sell and deliver this product by the pallet. Each bag is 3 cu. feet compressed (7 cu. ft. before compression), and there are 45 bags per pallet. Shipping price for one pallet of is the same as the price for one ton of heating pellets. Please order by the pallet. You can still stop by the farm and pick up as many bags as you need at $5.85 per bag. This is not a product for your pellet stove. PLEASE NOTE: Your order will be delivered in 1-3 weeks. You will be contacted a few days before our driver delivers.